Take the Ancient Roman Titus, mix it with a healthy dose of Italian, and you’ll arrive at today’s choice. 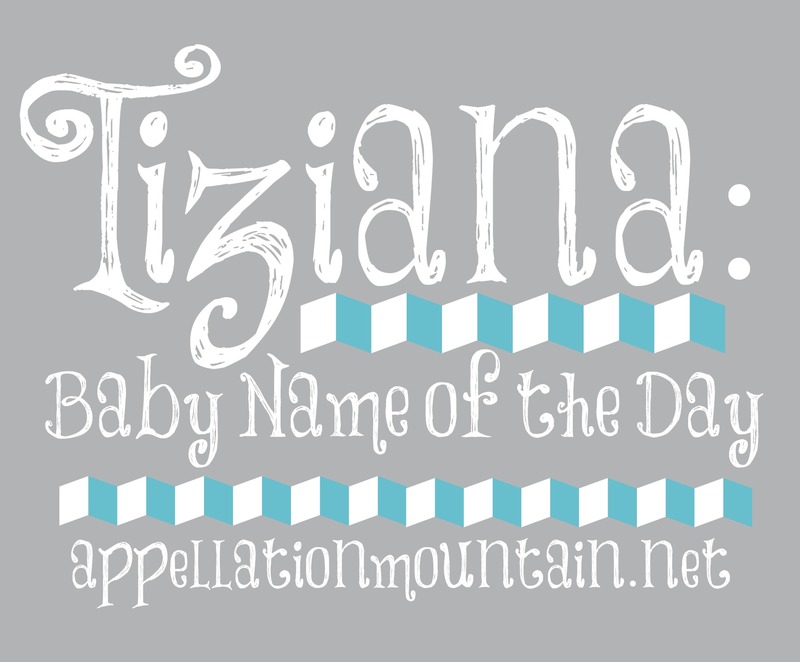 Thanks to Calien for suggesting Tiziana as our Baby Name of the Day. I’ve always been fascinated by Titania, the fairy queen from Shakespeare’s A Midsummer Night’s Dream. The Bard didn’t invent fairies, or even the idea that they had a monarch. But he was the first to name her Titania, a name borrowed from Ovid. Ovid referred to the daughters of Titans – the primeval gods – as Titania. Then there’s Tatiana, the name of a third century Russian saint, a literary heroine, and Russian princesses, including one of the ill-fated Romanov sisters. Neither has a thing to do with Tiziana – at least not directly. And yet, it does demonstrate that we have an appetite for glittering, mysterious names in this key. Tatiana ranked in the 200s back in the 1990s, the age of Alexandra. And yet, there are some interesting threads tying the three together. Tiziana is simply the feminine form of Tiziano, which is an Italian masculine name evolved from Titus. This, of course, leads us right back to Shakespeare again, and his historical tragedy Titus Andronicus. Titus probably comes from the Latin titulus – also the source of our word title. There’s a Titus in the New Testament, friend of Saint Paul, and bishop of Crete. There was also a Roman Emperor by the name. You can find a handful of men answering to Titus through the years. The Renaissance master Titian was born Tiziano Vecelli in the Republic of Venice in the late 1400s. 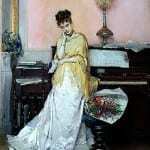 Tatiana comes from a separate Roman name, Tatius. The original bearer of the name was Titus Tatius, a Sabine king sometime before the first century BC. By the 1960s, Tiziana was big in Italy. 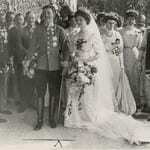 Notable bearers include actresses and athletes, plus ballerina Tiziana Lauri. The name seems to appear regularly from the late 1950s into the early 1970s. And yet, I don’t have a great source for hard statistics on Italian given names from the era. 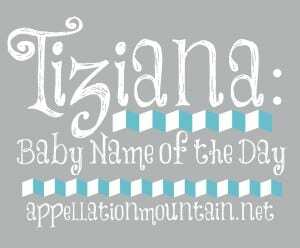 Italian baby name websites content themselves with repeating Tiziana’s roots as a form of Titus and Tiziano. From Italy, the name spread into the Spanish-speaking world. Tiziana Dominguez is a Spanish-born fashion designer, the daughter of designer Adolfo Dominguez. Let’s say that Tiziana is definitely not a popular choice in Italy today. 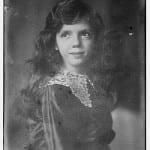 But I can’t say if Tiziana be regarded as a name headed for extinction, a sister for Beulah, or more of a rarity with potential, like Cordelia. Tiziana is rare – fewer than five girls were given the name in the US in 2013. And yet, American parents have embraced Adriana and Francesca. Alessandra is on the rise, even as Alexandra fades. Plus, high profile parents from Giada De Laurentiis to Snooki have chosen Italian names, and raised their profile. Tiziana’s ‘z’ should be a bonus, but nicknames like Tizzy – as in “in a tizzy,” distressed – might present a challenge. Tana and Tee are possible short forms, too. Overall, Tiziana is an intriguing Italian rarity. With ties to saints and an undeniable history of use, this could be the perfect choice for parents after a rare Italian name for a girl.